There are two diffrent ways to wire a ceiling fan, you can wire it so that it works by the pull strings. Or you can wire it so that the light and fan are turned on and off by light switches. Refer to the installation guide that came with the fan for exact wiring configurations for this. Also be sure that you are mounting it with a proper mounting box, do not mount a ceiling fan on a light fixture box the ceiling fan will fall down. To prepare for connecting the wires together, strip the plastic off the ends of the wires down from the end a half inch. Where it is referenced in the diagrem below as being the supply wire, this wire will be the wire that is coming from the light switch to the ceiling fan suppling the electric. 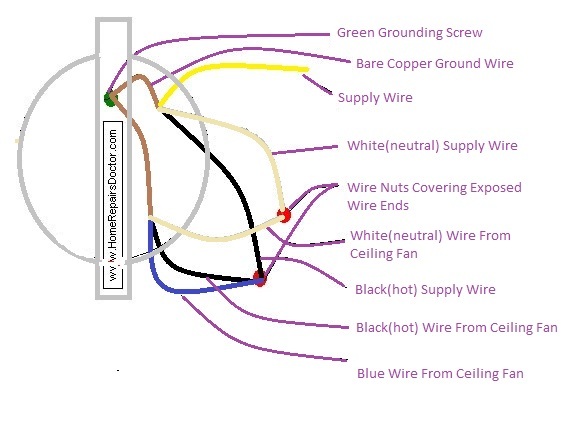 Connect the white(neutral) wire from the supply wire to the white wire to the fan, twist these two wires together. Install wire nuts covering the exposed wire ends. Connect the black(hot)wire from the supply wire, the black wire to the fan, and the blue wire from the ceiling fan and twist these three wires together. Install a wire nut covering the exposed wire ends. Connect the bare copper(ground)wire from the supply wire and the bare copper wire from the ceiling fan to the grounding screw located on the mounting bracket. Finish installing the fan blades and light assembly.